Photo on the mountain at Eyarth of (left to right) Eyarth Lili Marlene, Cordelia and Athene, taken by Theo ten Brinke Spring, 2012. 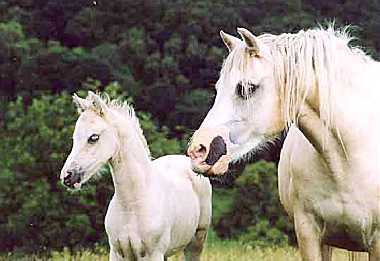 FOALS FOR SALE - SEE FOALS PAGE! 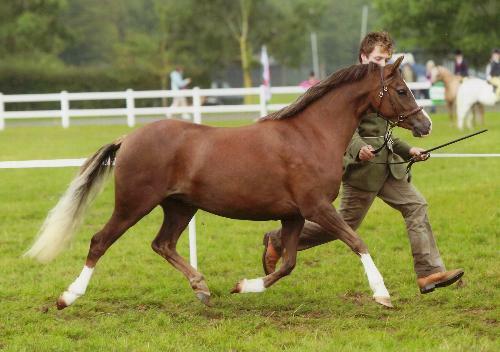 Eyarth Amaretto - 3 year old chestnut gelding by Hilin Etifedd ex. Eyarth Venus. 13hh. Will make a great WHP. (Photo to follow). Eyarth Tuscan - yearling colt by Rhoson Shem ex. Eyarth Pansy. (Photo to follow). [Updated 9th of July, 2014]. Eyarth Stud was founded in 1968, shortly after I left school. I had been inspired by the Welsh ponies ever since I saw the Weston Stud, and decided that breeding Section B's was what I wanted to do. Thanks to my dad’s eye as a stockman, and my mum’s drive and enthusiasm, our ponies have enjoyed success in many fields – showing in hand, under saddle, dressage and riding. I am also delighted to say that our ponies have been exported all around the world, and have been very successful for their new owners. 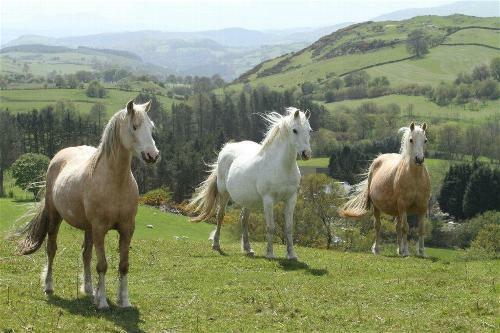 The stud is located at Clegyr Mawr, near Melin-y-Wig, in the upper reaches of the Vale of Clwyd. Clegyr is a working farm; we have a pedigree herd of Welsh Blacks and 600 head of sheep. 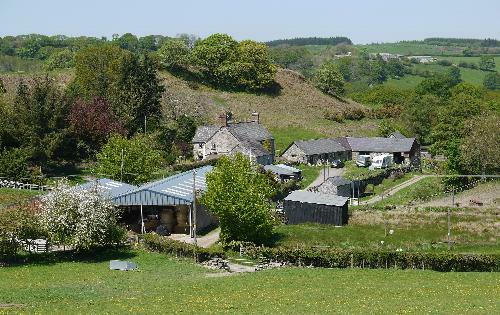 The land range of the property is between 700 and 1100 ft.
We started the stud on a very small scale when Dad bought the mares TanLan Swynol, and later, Crossways Champagne and Coed Coch Bettrys. In those early days we leased stallions such as Ardgrange Heritage and Sintoncourt Perilustre. We registered the first Eyarth ponies - Eyarth Bettula and Eyarth Dubonnet in 1970, which was also the year that we acquired the filly Leighon Glamour at the Fayre Oaks sale. Glamour’s fourth foal for the stud, a colt, Eyarth Celebration (Kelly) by Keston Royal Occasion, was to prove the greatest influence on the Eyarth blood-line. Kelly was the first colt that we retained for our own use. He gave us our first win at the RWAS when, as a yearling, he was top of his class, reserve champion youngstock, and reserve male champion. Before that, as a foal, he was unbeaten wherever he was shown. 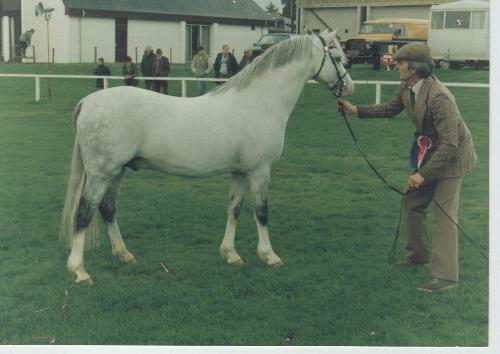 Kelly’s most successful year in the show ring was 1987, when, on loan to Tom Best and David Blair of the Waxwing stud, he was overall native champion and reserve supreme champion at the West Midland Stallion Show, supreme at Glanusk and champion at Lampeter, champion at the Royal Highland and the National Pony Society as well as reserve champion at the Great Yorkshire Show. His influence on our bloodlines is beyond measuring, but he and his progeny have also influenced the Section B look in Holland, Sweden, Canada, Australia and the USA. We are incredibly grateful to him. In 2011, a limited edition of Celebration was kindly made by Elizabeth Henderson. In 1979 we bought the 3 year old filly Weston Twiggy from the Edwards family shortly before their departure for Australia. We never showed Twiggy, but again, her influence on the look of the stud as it is today can not be doubted. 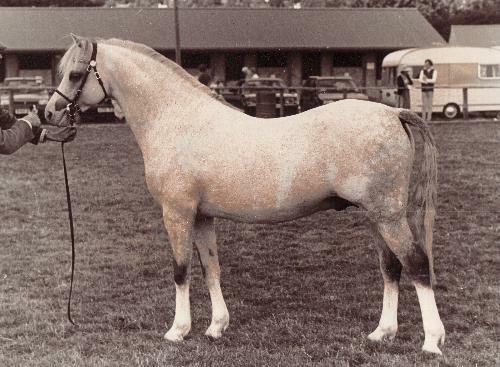 Twiggy produced no less than 16 foals for us, many of whom are now champions. Her pairing with Eyarth Celebration produced many show winners for us, notably Eyarth Arabella and Eyarth ZsaZsa. Arabella was Twiggy’s first foal by Kelly. 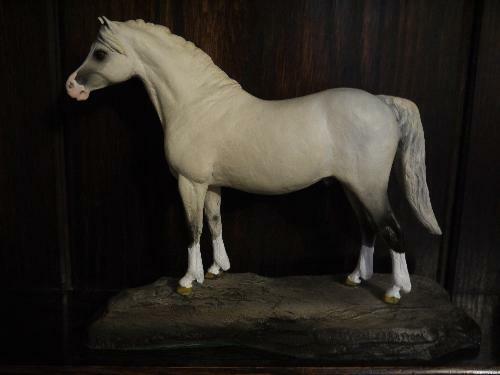 When put to Hilin Caradus she produced E. Cordelia, dam of E. Windflower, 3 time winner at the RWAS, standing supreme in 2002, and mountain and moorland champion at the Royal of England Show in 2003. 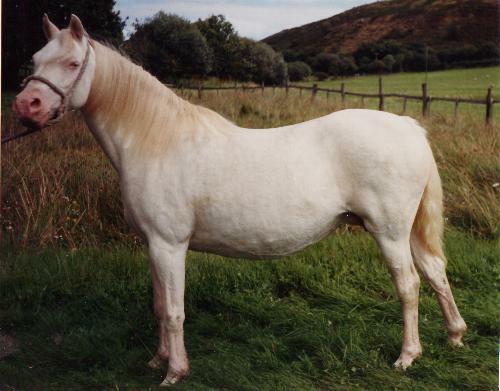 Arabella was also crossed with Carwed Charmer (son of Hilin Caradus) with great success. Their sons include E. Sama (now at the Weston Park stud in Australia), Eyarth Tayma (now with our good friends Dewi and Eirian at the Hilin stud), and Eyarth Tigra (at the Bamborough stud in Australia) all of whom are champion stallions in their own right. Zsa Zsa was born in 1983. 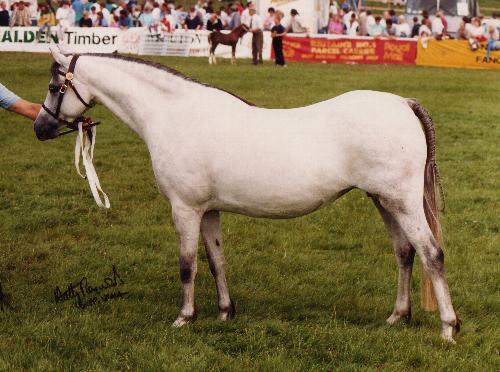 She won the novice mare class at the RWAS in 1990 and produced a string of champions. Perhaps the best known of Zsa Zsa’s progeny is Eyarth Rio, by Hafodyresgob Busby. Rio was bought by David Jones and Geraint Thomas of the Telynau stud and has since enjoyed a spectacular career. He has won the WPCS Sire Ratings competition 3 times, qualified for the Horse of the Year Show twice and has sired many other champions. Zsa Zsa's progeny also includes Eyarth Tomahawk, Eyarth Beau Geste, and Eyarth Sophia. Sadly we lost Twiggy in 2000. Her last foal, EyarthTacoma, a colt by Carwed Charmer, was fostered by Gwyn Berry’s Section C mare Bettws Nell, to whom we are extremely grateful. We decided to retain Tacoma for use as a stallion,but have since sold him to Donald Cooke of the Bureside Stud, as he is simply too close to our mares. You are visitor since November, 2006.